The center, managed by the Bureau of Land Management, is about 26,000 square feet nested on top of Flagstaff Hill. The trip to the top of the hill is a winding affair, but once you make the mile-long journey, it is well worth it. 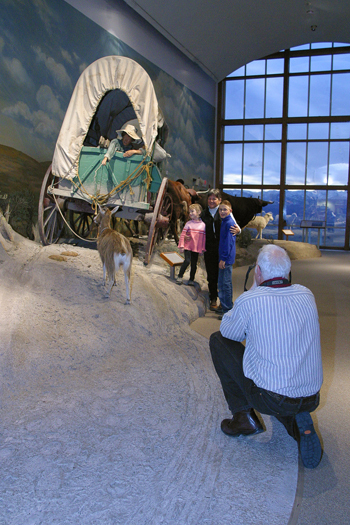 The first thing you notice when you arrive at the center, are the authentic, scale Oregon Trail wagons – in the summer they come complete with canvas tops, during the winter months the wind is pretty brutal so the fabric is taken inside. During the Spring and Summer, volunteers act out a camp scene, and will even feed you trail stew, if you dare. There are big events during three-day weekends during the summer, so make sure to plan your trip to the center accordingly. That’s the thing about the interpretive center, you might go to learn about the history of the Oregon Trail, but there is so much more. Kelly Burns, a park ranger at the center, said that since it’s opening in 1992, approximately 60,000 people a year visit. She also pointed out that to really enjoy all aspects of the center, and the surrounding area, make sure to give yourself a half a day at least. You can walk through the exhibits, and along the way hear stories about how the trail was on families. There are several stops during the presentation, where you can figure out how you would pack your wagon, and pointing out some of the wildlife you would see along the trip. In addition the center also has the Flagstaff Gallery, a space where exhibits change three to four times a year. From a holiday exhibit during the winter months, to children’s art during the spring and summer, it’s a way to show different aspects about the Oregon Trial. Also make sure you don’t miss the working stamp mill – a mill that was used to separate dirt and minerals from gold. The center not only has a model, but also a life-sized version you can tour. In addition, there are also working mines visible from the center, so make sure to take in some of the stunning views, and ask lots of questions. The high point of visiting the center, for me anyway, wasn’t even inside the interpretive center – although the gift shop run solely by volunteers with proceeds helping to run the center was pretty nice. No, the high point of the trip was seeing the actual ruts that are still evident from the wagons travelling on the Oregon Trail. That’s right, the path is still there, and you can walk along it, and even stand in them. It’s one thing to see the plaster statues of what it might have looked like when families picked up and started the journey west. It’s quite another to be standing on the spot, in the actual evidence that the event really happened. It gives you a new appreciation for just how difficult the journey was, and how it made an indelible mark on Oregon that is more than just the cities and population. About the Oregon Trail: During eight decades in the 1800s the Oregon Trail served as a natural corridor as the United States moved from the eastern half of the continent toward the west coast. The Oregon Trail ran approximately 2,000 miles west from Missouri toward the Rocky Mountains to the Willamette Valley. A trail to California branched off in southern Idaho. The Mormon Trail paralleled much of the Oregon Trail, connecting Council Bluffs to Salt Lake City. About the National Historic Oregon Trail Interpretive Center: The National Historic Oregon Trail Interpretive Center at Flagstaff Hill portrays and interprets the Oregon Trail experience and its related themes, while preserving and protecting its historic, cultural heritage, natural, and visual features. The Center serves as a focal point for the cultural heritage traveler, contributes a viable tourism industry for the area, and is committed to maintaining strong community partnerships. What to bring: There is no café at the center, so if you are planning to make a day of it – and there is enough to do to keep you busy for a day if you read all of the history and talk to the volunteers – make sure to bring a picnic lunch. There are tables available for eating. Also, there is quite a bit of walking and hiking involved, so make sure to put on those comfortable shoes before you head out. Tip: For seniors who want to miss the school rush at the center, most students visit the center in May. So if you are looking to avoid the tidal wave of teens, plan your trip for another month. In addition, if you want to stand in the ruts of the Oregon Trail, you don’t have to go for a mile hike down a steep hill (and be faced with the return trip). About a mile away from the center is a clearly marked historical sign with a gate. Go through the gate and a few steps away you can see the ruts and the trail. Season: The center is open year-round, but most of the interpretive actors and activities are taking place in the spring, summer and fall. Getting there: You don’t need trail ruts to find the Oregon Trail Interpretive Center if you have a GPS, simply type in 22267 Oregon Highway 86, Baker City – but please don’t do it while driving. For those of us without the highfalutin technology at our fingertips, take Interstate 84 to exit 304 to Highway 86 and follow the signs.